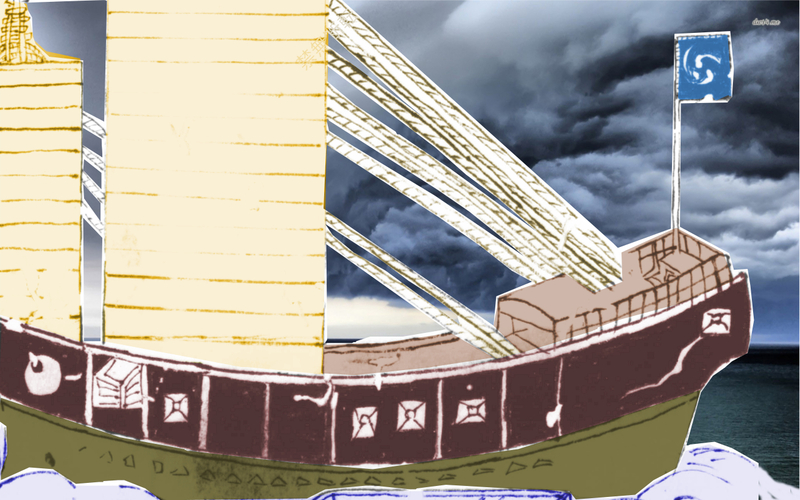 The ship is a tribute cargo ship (kaisen 楷船) in the service of the royal government of Ryūkyū. The products loaded are destined to be landed at the Ryūkyū Kariya 琉球假屋 in Satsuma. At the time when the tribute ship goes to Satsuma, the managerial post is referred to as the Ryūkura-yaku 琉蔵役 (Ryūkyū warehouse manager). Shiohira Pēchin 潮平親雲上 served in this post. Pēchin describes the rank of the leader (頭投) assigned to a certain task. 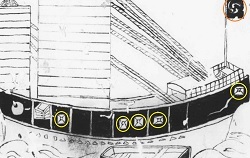 For the use as a Kaisen tribute ship to Satsuma, the raised storehouse for weaponry is removed and the embrasures closed (yellow circles). The royal coat-of-arms (orange circle) flies at the bow of the ship. From: Ōshima Hikki from Kōchi Prefectural Library. These Shinkōsen have a raised storehouse for weaponry (yagura 矢倉) and embrasures (hazama 狭開), where artillery 砲 is placed in, and they are equipped with bows and arrows as well as guns and other weapons. This is necessary as a security precaution against the pirates of the seas 海賊. After such a Shinkōsen had been used three times for the journeys of bringing tribute to China, the raised storehouse for weapons (yagura) is removed, the embrasures (hazama) sealed, and it is then used as a Ryūkyū royal government tribute ship going to Satsuma. The ship is now referred to as Kaisen 楷船. When boarded in springtime, they are more specifically referred to as Harisaki Kaisen 春先楷船 (springtime tribute ship), and when boarded in summer they are called Natsutate Kaisen 夏立楷船 (summer tribute ship). As a flag the ship sports the mitsu-domoe 三巴 coat-of-arms on a dark blue cloth, which is the symbol of the king of Ryūkyū. Even if the ship doesn’t carry much official and personal cargo, this coat-of-arms without fail always decorates the bow of the ship. Note on the Ryūkyū Kariya 琉球假屋: In 1613 for the first time a new year mission from Ryūkyū reached Kagoshima. Ever since that time a Resident Commissioner from Ryūkyū and his staff stayed in Satsuma, acting as an intermediary between the two countries. For this purpose an agency for liaison and coordination called Ryūkyū Kariya was built, located in the area below Kagoshima castle. It served as a diplomatic consulate, a trading facility, an education facility etc. Official functions were carried out all year around. This entry was posted in Ōshima Hikki and tagged Harisaki Kaisen, Kaisen, Natsutate Kaisen, Ryūkyū Kariya, Shinkōsen, Tribute Ship, 夏立楷船, 春先楷船, 楷船, 琉球假屋, 進貢船. Bookmark the permalink.